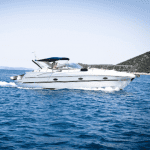 Boat decks and docks can become slippery when wet. Of course, you would need to use caution for everyone’s safety. Some surfaces could benefit from applying a non-skid coating such as Tuff Coat. 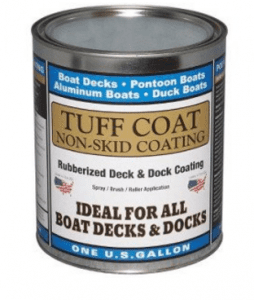 Tuff Coat is a rubberized deck coating to make surfaces less slick. Tuff Coat is a great addition to improve many slippery surfaces. 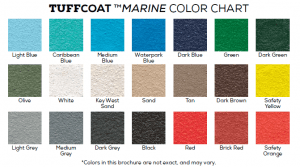 Tuff Coat is a product that is both UV and impact resistant for the best long-term use. It can be applied to many surfaces including concrete, wood, fiberglass, aluminum and steel. You may ask, what if it is already been painted? The answer is, yes, it will adhere to those surfaces, too. There are many other perks to using Tuff Coat. One great feature is that it is environmentally friendly! No VOCs or isocyanates are included in this product. It is chemical resistant and non-flammable. Aside from boat decks and docks- it can be used on a multitude of surfaces or projects. This material has been used around pools, water parks and stadium stairs to prevent slippery surfaces. This product is known as the world’s number one rubberized non-skid coating. 1 gallon of Tuff Coat will cover 45 square feet. 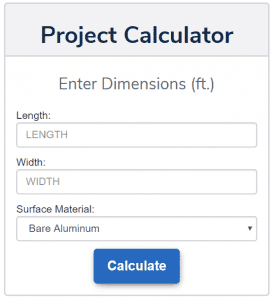 With the online project calculator, you can choose your length, width and surface material to determine the needed amount of product. There are 21 different color options to match your preference. With the right application tools and primer, it will be a breeze to install! This product will result in a textured and non-skid surface!